The Ike provides breathable wind-stopping performance needed on the bike and a wool jacket look that can be worn all day. The innovative woven zippered jacket has hidden nylon front panels to stop the wind, a bike specific fit, heat-regulating two way zip and pit vents, cargo pockets, and reflective details. 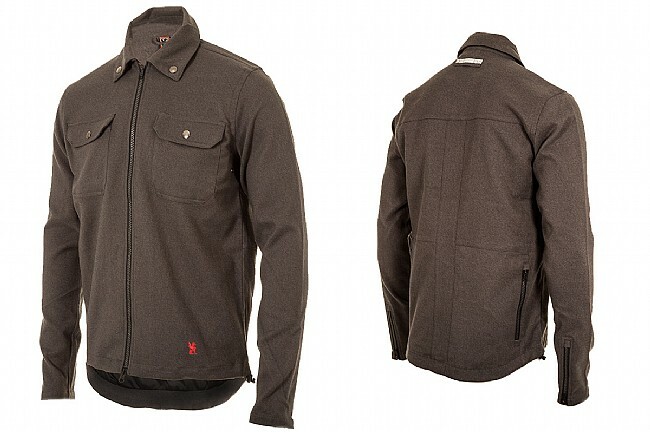 The Ike is the only jacket the urban commuter needs. This has quickly become my go to jacket. The cut is perfect while riding but the sleeves can feel a bit long off the bike. This has not stopped me from constant use. The fabric tends to trap smells so you need to be ready to wash it. Great news is it washes perfect. Great cut and looks this would be the perfect jacket if it was wool.